Dr. John Andreas Scherer, a German physician, published a dissertation, nearly about the same time, in which, without knowing that Dr. Beddoes had made the same assertion, he demonstrated that Dr. Mayow had laid the foundation of the antiphlogistic theory in chemistry. 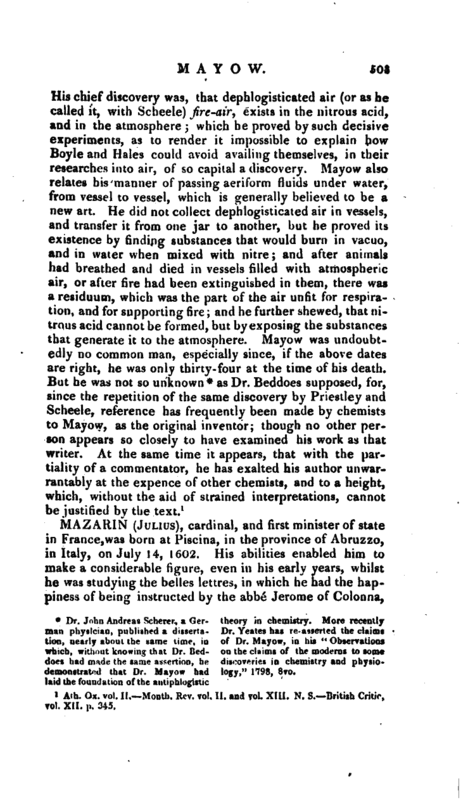 More recently Dr. Yeates has re-asserted the claims of Dr. Mayow, in his “Observation* on the claims of the moderns to some discoveries in chemistry and physiology,” 1793, 8vo. | who afterwards became a cardinal. 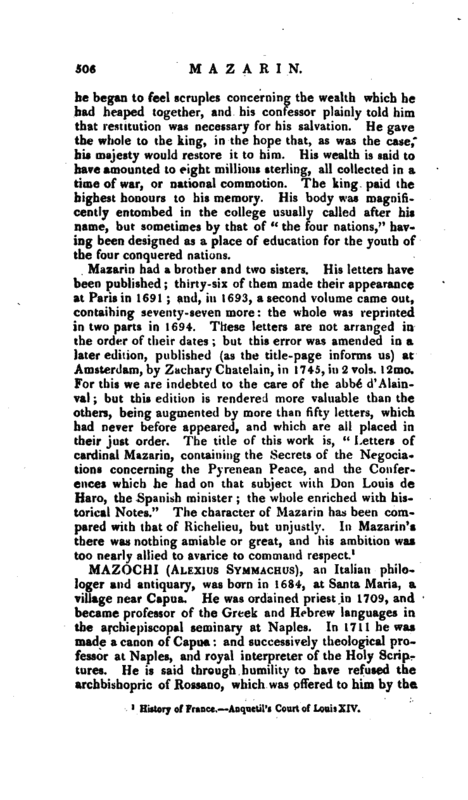 This illustrious person went to reside in the university of Alcala in Spain, whither he was followed by Mazarin, who applied himself to the law, and at his return to Italy, took his doctor’s degree. He went afterwards to the court of Rome, where he became acquainted with cardinal Sacchetti, whom Urban VIII. sent into Lombardy. It was through his means, that Mazarin was instructed in every particular relating to the interest of the difff rent princes who were then at war respecting Cassel and Montserrat. Soon after this, the cardinal Antonio Barberini, nephew to the pope, came into the Milanese and Piedmont, in the character of legate, to conclude a peace. Mazarin embraced his cause so warmly, that he was ordered to remain upon the spot with the nuncio James Pancirole, and to assist him in his endeavours to conclude this great affair. He here scrutinized closely the designs of the French, the imperialists, the Spaniards, the duke of Mantua, and the duke of Savoy; and took such measures as might best reconcile and strengthen their various interests. 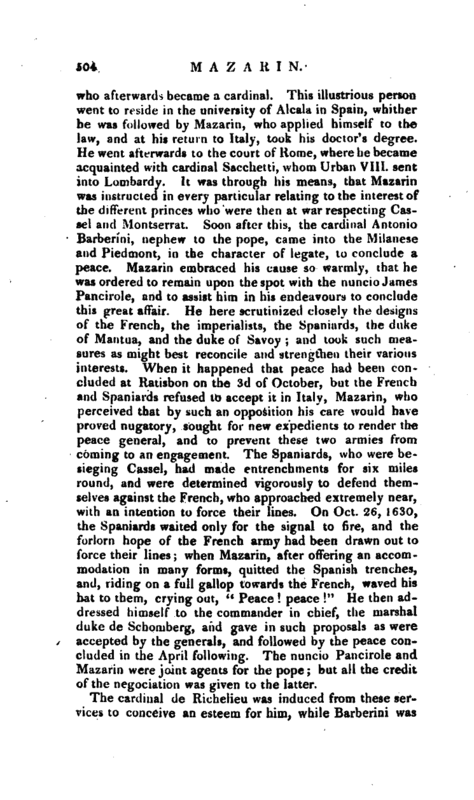 When it happened that peace had been concluded at Ratisbon on the 3d of October, but the French and Spaniards refused to accept it in Italy, Mazarin, who perceived that By such an opposition his care would have proved nugatory, sought for new expedients to render the peace general, and to prevent these two armies from coming to an engagement. The Spaniards, who were besieging Cassel, had made entrenchments for six miles round, and were determined vigorously to defend themselves against the French, who approached extremely near, with an intention to force their lines. On Oct. 26, 1630, the Spaniards waited only for the signal to fire, and the forlorn hope of the French army had been drawn out to force their lines; when Mazarin, after offering an accommodation in many forms, quitted the Spanish trenches, and, riding on a full gallop towards the French, waved his hat to them, crying out, “Peace! peace!” He then addressed himself to the commander in chief, the marshal duke de Schomberg, and gave in such proposals as were accepted by the generals, and followed by the peace concluded in the April following. The nuncio Pancirole and Mazarin were joint agents for the pope; but all the credit of the negociation was given to the latter. The cardinal de Richelieu was induced from these services to conceive an esteem for him, while Barberini was | equally attached to him, and prevailed upon Urban VIII. to make him keeper of the seals. He went in 1634 to Avignon, in quality of vice- legate, and to France in that of nuncio extraordinary, where he acquired a profound knowledge of state affairs, and with much art cultivated at the same time, the friendship of Richelieu, and the good-will of Louis XIII. In compliment to the nomination of this monarch, the pope added him to the number of cardinals in 1641. 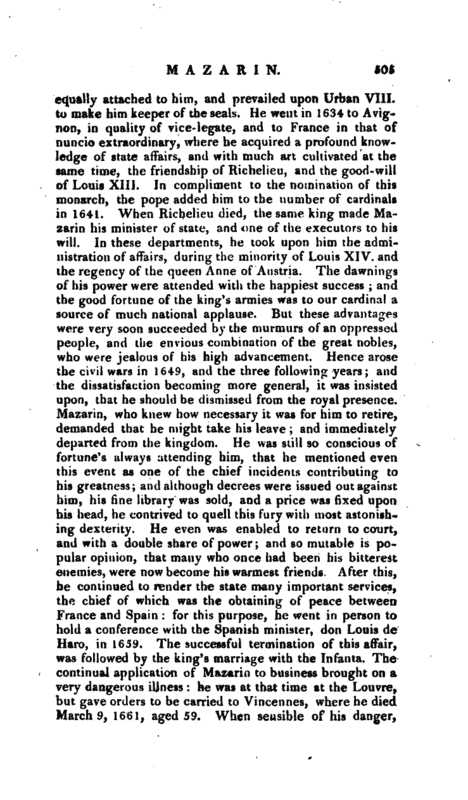 When Richelieu died, the same king made Mazarin his minister of state, and one of the executors to his will. In these departments, he took upon him the administration of affairs, during the minority of Louis XIV. and the regency of the queen Anne of Austria. The dawnings of his power were attended with the happiest success; and the good fortune of the king’s armies was to our cardinal a source of much national applause. But these advantages were very soon succeeded by the murmurs of an oppressed people, and the envious combination of the great nobles, who were jealous of his high advancement. Hence arose the civil wars in 1649, and the three following years; and the dissatisfaction becoming more general, it was insisted upon, that he should be dismissed from the royal presence. Mazarin, who knew how necessary it was for him to retire, demanded that he might take his leave; and immediately departed from the kingdom. He was stili so conscious of fortune’s always attending him, that he mentioned even this event as one of the chief incidents contributing to his greatness; and although decrees were issued out against him, his fine library was sold, and a price was fixed upon his head, he contrived to quell this fury with most astonishing dexterity. He even was enabled to return to court, and with a double share of power; and so mutable is popular opinion, that many who once had been his bitterest enemies, were now become his warmest friends. After this, he continued to render the state many important services, the chief of which was the obtaining of peace between France and Spain: for this purpose, he went in person to hold a conference with the Spanish minister, don Louis de Haro, in 1659. The successful termination of this affair, was followed by the king’s marriage, with the Infanta. The continual application of Mazarin to business brought on a very dangerous iUness: he was at that time at the Louvre, but gave orders to be carried to Vincennes, where he died March 9, 1661, aged 59. When sensible of his danger, | he began to feel scruples concerning the wealth which he had heaped together, and his confessor plainly told him that restitution was necessary for his salvation. He gave the whole to the king, in the hope that, as was the case, his majesty would restore it to him. His wealth is said to have amounted to eight millions sterling, all collected in a time of war, or national commotion. The king paid the highest honours to his memory. His body was magnificently entombed in the college usually called after his name, but sometimes by that of “the four nations,” having been designed as a place of education for the youth of the four conquered nations. 1 History of France. Anquetil’s Court of Louis XIV.